A tour schedule for Dinner and Bikes 2014 is just starting to shape up. 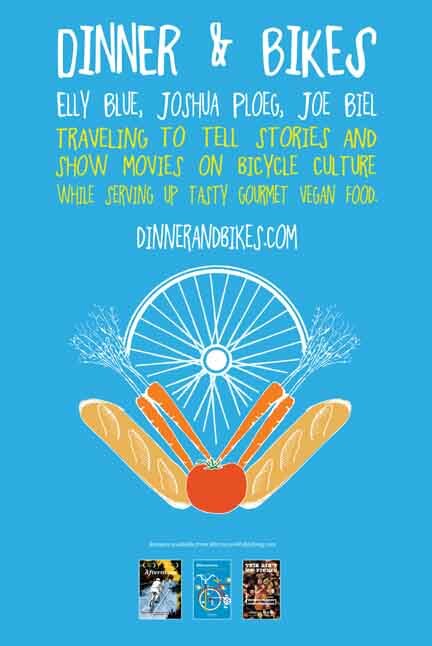 Elly’s new book, Bikenomics, is just about to come out. And we’re running a Kickstarter in honor of both these events. The best news is that funds raised in this Kickstarter will help take the fundraising burdens off some of our organizers/event attendees. Plus you can get some sweet rewards, including the tools to create your own Bikenomics event if you can’t make it to one of ours. In other awesome news, Joshua has a new cookbook coming out, too. Things don’t get much more exciting than this brightly colored, punk rock ode to lighter-toasted vegan s’mores, cooking on your car radiator (maybe we’ll try this on tour), and much much more. Check it out, grab a book, and bring it along for him to scrawl in when we come through your town.